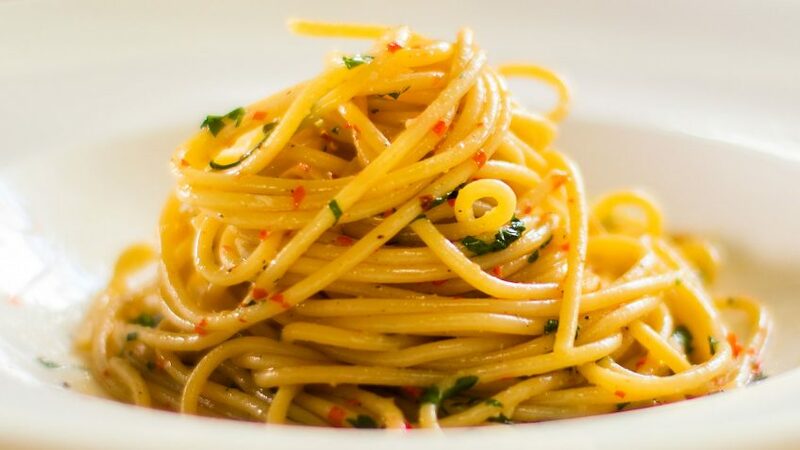 A classic oil and garlic pasta sauce, aglio e olio, where it’s usually served with spaghetti. Some say it originated somewhere between Naples and Rome, that’s still unclear but it is a Southern Italian dish. One thing that is clear, it’s a quick and easy dish to make, under 15 minutes. Made with five simple ingredients, pasta, garlic, chili, olive oil and parsley. And no, there’s no cheese, and if you do add cheese, do it at night behind closed doors or you may just start a revolution. A great cheap quick meal that’s become one of the most satisfying pasta dishes. What are you having for lunch? Can I suggest aglio e olio? Happy cooking! Boil a large pot of water. While the water is boiling, get your ingredients ready. Add salt to water once boiling. Peel and slice the garlic razor thin. Thinly slice and chop the chili. Add spaghetti to boiling water (you can salt but no oil, cook approx. 3 minutes less than indicated on packet. To a large frying pan, add the olive oil and turn on heat. Add the garlic and chopped chili. Fry until the garlic becomes a little light brown on edges, then add half a cup of the boiling pasta water. Strain your spaghetti (keep a little water on side just in case sauce runs dry). Add spaghetti to the hot oil in frying pan. Mix well and gently for 3 minutes, add a little more water if pasta absorbs it. You want a tiny bit of liquid left after 3 minutes. Salt your pasta water correctly, it requires a lot of salt and should taste a little less salty then sea water.